Vegas Fortune tries to bring the Las Vegas experience to you, focusing on the shows that you can watch while you’re in the city of sin. The showgirls are present in the background, but that’s about all the Las Vegas that you get. The symbols are classics or dollar signs, so only the background is themed. I’m not that impressed with what this game has to offer, but if you have a thing for Las Vegas, keep reading the review for a better idea of what you can expect. Like a true Vegas classic slot should, this title comes with only 3 reels, but it manages to cram 5 paylines on them. You can get paid up to $25,000 while playing it and a wild symbol is the one feature you can take advantage of along the way. The Dollar Sign symbol would be the only feature that you have access to if you play this game. It’s used as the wild feature, while also being the one to trigger the slot’s biggest prizes. You have five lines total, so no matter where the wild lands there is a chance that it will contribute to the formation of a new combo. You need the other symbols on the line to be regular symbols and/or wilds, to get something out of it. All paylines can bring you prizes when three Dollar Signs form a combo on them, but some pay a lot better than others. The maximum of 5,000 coins is obtained when the combo gets on the 5th payline. 1,000 to 2,500 coins are offered by the other four bet lines. For each active line, the game requires that a coin be used, so you can end up with a 5 coin wager. You also choose what denomination is used, with the maximum being $5, while the minimum is $0.25. Wagers vary between $0.25 and $25 as a result. 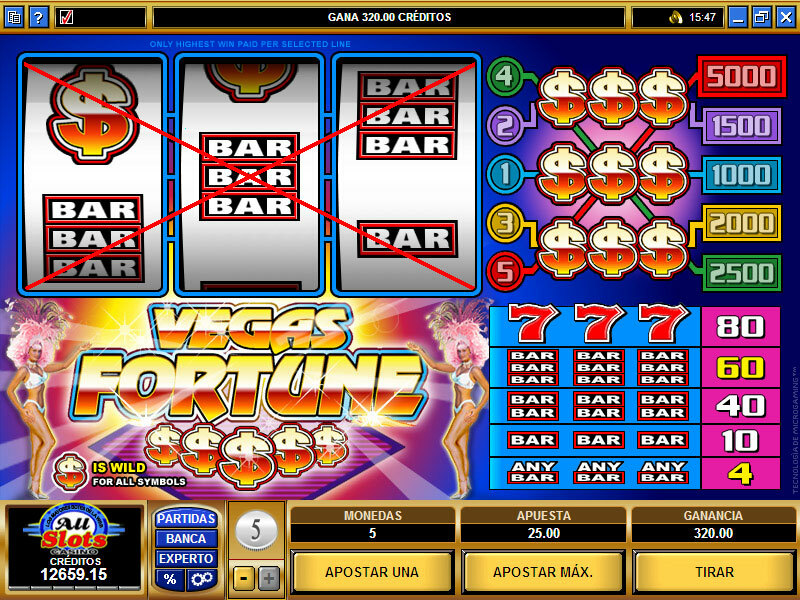 Five paylines are used in the game, and each one gives you a different payout for the same combo. The 1st line awards 1,000 coins, the 2nd one 1,500 coins, the 3rd line 2,000 coins, the 4th awards 2,500 coins and the 5th one 5,000 coins. That last line pays the best, up to $25,000 cash. Las Vegas is obviously the inspiration for this game, and you can see it in the showgirls that are part of the logo area, dressed rather summarily and with feather headdresses. Dollar signs and classic icons are used as symbols, but the connection to Las Vegas is a lot weaker in their case. Symbols: Dollar Sign (5,000 coins, wild), Red Seven (80 coins), Three Bars (60 coins), Two Bars (40 coins) and One Bar (10 coins). The Vegas experience is there, but it doesn’t feel like it’s good enough. Still, for a fan of the city that had some great times there, it might be just the right thing. 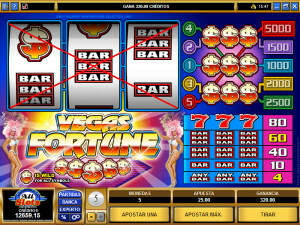 The Vegas Fortune slot machine is offered through the Microgaming platform, so if you want to play it for real or just to practice, look out for casinos that use it.